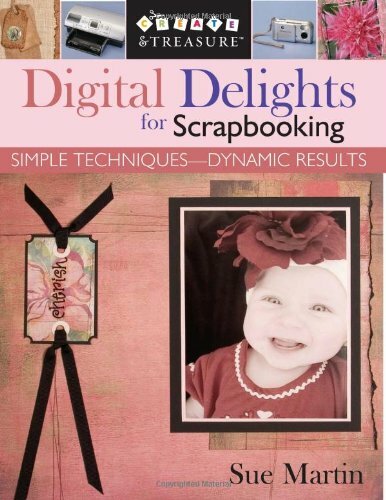 Digital Delights for Scrapbooking: Simple Techniques-Dynamic Results (Create & Treasure (C&T Publishing)) by Martin, Sue: C&T Publishing 9781571203427 PAPERBACK - BookResQ. Tips and tricks to take your best photos yet and use them in one-of-a-kind scrapbook pages. Sue Martin has worked for Hewlett-Packard since 1977, witnessing the evolution of today's printers, inks, and digital cameras. A popular crafts teacher, Sue has been scrapbooking for more than a decade, and enjoys bringing her technical expertise to her creative work. We run a General interest bookstore with a focus on popular fiction, Utah and Mormon (LDS) titles, as well as current textbooks. Orders usually ship within 2 business days. Shipping costs are based on books weighing 2.2 LB, or 1 KG. If your book order is heavy or oversized, we may contact you to let you know extra shipping is required. Many books cannot be shipped to international locations. This will be noted in our description. Address: West Valley City, UT, U.S.A.